If you are looking for a cute little maternity top or a sparkly black maternity dress for an upcoming Christmas party then head to Mothercare. I have just spotted they have some fab new pieces that would be ideal! The sparkly Blooming Marvellous maternity shift dress is gorgeous and so easy to wear over your bump. You will be able to create a chic look in seconds. Team with some black kitten heels and statement jewellery for yummy mummy maternity status. Jessica Simpson ‘pregnant’, is she or isn’t she!? Now i am not one to speculate and I love Jessica Simpson and always think she looks fab, but after seeing some of the latest snaps of her here in New York i am finding it hard to believe that she has just eaten a bit more than usual!? She has that pregnant glow about her and the protective hand over her stomach i think is a real giveaway - unless she is still just playing games with the paps. When i was pregnant i searched high and low for a stylish maternity blazer and could not find one anywhere that was not part of some bland maternity suit. I love blazers and had about 10 different ones in my wardrobe all different colours and styles, but none covered my pregnant body correctly. I just love the masculine look a blazer gives your outfit whether it be skinny jeans or a cute little skirt, and i wanted to get that same look sporting my baby bump. David and Victoria Beckham have been pictured at the weekend with little baby Harper watching their boys play football during a family day out in LA. Both parents doted upon the little tot as they supported their sons during the game and were seen to share a number of tender embraces as a family. Bicester Village – I need to go!! Enjoying the LA sunshine over the weekend, Jessica Alba was pictured enjoying family time in the park with both her gorgeous little girls, Honor 3 and baby Haven. Dressed in similar matching checked shirts Jessica and Honor were the epitome of the phrase 'like mother like daughter!' Honor was having a fabulous time laughing and playing around as her mother doted on the new addition to the family. 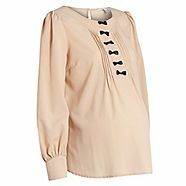 Isabella Oliver maternity have some gorgeous new stuff ready for Autumn winter. As a maternity brand they are probably one of the best in terms of fit, style and quality and perfect for the pregnant fashionista. Isabella Oliver helps you to stay fabulous even with a burgeoning belly! Jack Osbourne is going to be a daddy! The reality TV star announced the pregnancy news on the Piers Morgan show last night where he appeared with mum and dad, Sharon and Ozzy. Jack declared he was 'excited, a little nervous!' The news comes just two weeks after Jack proposed to his girlfriend Lisa Stelly. All his family appear to be over the moon with such happy news especially his sister Kelly who tweeted her excitement! I can't wait to see this baby story progress! And we now have another welcome yummy mummy celebrity to follow in the maternity style steaks!